Melissa Burch is a woman about adventure, and I think you’ll see that in her interview here. Be sure to answer her question, would you, in #10. What’s your philosophy about reading reviews of your work? 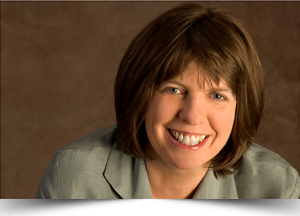 I can’t wait to hear your thoughts about Melissa’s book and reviews. Enjoy. I didn’t identify as a writer, so it all began when my best friend and I decided to call each other at 6 am and to write. After three months my friend, who had written a fiction book, said she would help me create an outline for a book. I ended up ignoring the outline, never read the original writings, and wrote about my 20s. 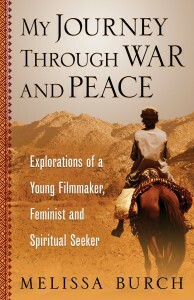 My Journey Through War and Peace: Explorations of a Young Filmmaker, Feminist and Spiritual Seeker is a memoir based on my time as a war journalist for BBC, CBS, and other networks. My team was one of the first documentary crews in the Soviet Union at the height of the Cold War, and a story about me in Afghanistan was featured in The New York Times. 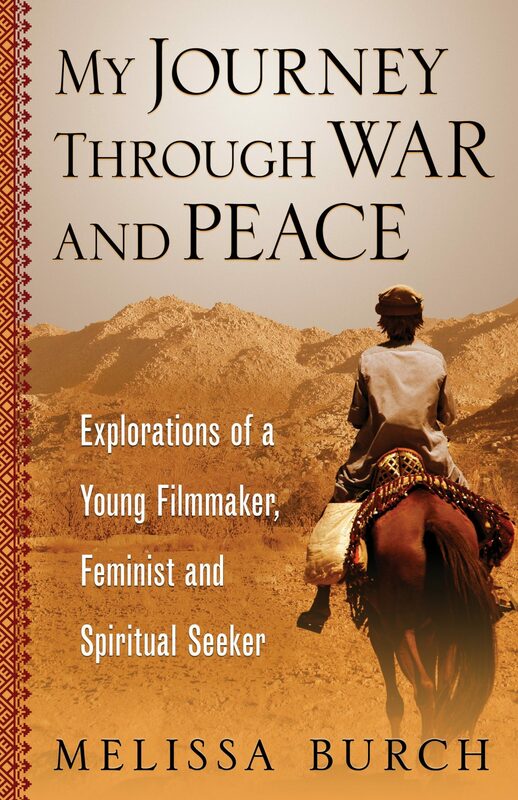 I was just in my 20s when I traveled with the mujahedin, filmed an attack on a Soviet convoy, slept with an Afghan commander, and climbed 14,000 feet mountains in the Hindu Kush. I want people to be inspired, to be courageous, and take adventures in their lives (They don’t have to go to a war zone… just something out of their daily habits, routines, etc.). 2. What stories, themes, motivations do you find yourself drawn to in your work and in the works you read? I am very interested in the heroine’s journey, especially stories of women who have gone beyond the mother and lover roles. In fact, I’m now on a book tour called “Heroine’s Journey: Road Trip and Quest” starting March 1, 2016 in an RV with my husband and son. I hope to have conversations about feminine principles and living an integrated life with awareness for both our male and female sides. 3. What do you do when you’re not writing? Right now I’m traveling a lot. I love walks. 4. How do you balance what will sell with what you want to say? I didn’t think about what will sell; I wrote the best memoir I could. 5. What is your favorite part about being a writer? I love that it is possible to write anywhere and doesn’t require fundraising. I was an independent filmmaker and had to raise $ before doing anything. 6. What is your least favorite part about being a writer? The economics. There’s so little money for the writer and so much additional work required besides writing. 7. When you write, who do you imagine as your reader? I started off writing for a twenty year old and then grew up with her as I wrote. 8. What are a few of your favorite books of all time? I’m a kind of in the moment reader. I get very excited by a book that I’m just reading. Last night I finished Gloria Steinem’s memoir My Life on the Road, which was terrific , and it had lots of parallels with my life: traveling on the road and connection to the Native American values of feminine principles as a way to solve major issues in the world. 9. What are some things that get in the way of your writing? How do you move them out of the way? I’m a focussed type, so once I decide to write, I write. Now I’m in marketing stage and not expecting to write. It’s very freeing. 10. What’s your philosophy and practice about reading reviews of your work? It’s a new experience. I didn’t know I needed a philosophy and practice. Any suggestions?